You see this a lot in the city. 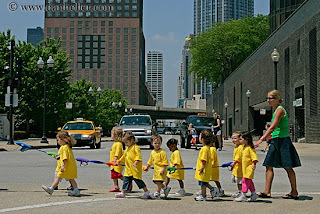 A group of pre-school aged kids walking from place to place holding on to a rope. Like here, they’re usually dressed in same-colored t-shirts five sizes too big contributing to it being the cutest-thing-you’ve-ever-seen. The rainbow rope with handles helps too. It’s a simple safety device, this buddy-system rope, invented by some genius teacher or mother with too many kids – a way to keep all your ducks in a row and right before your eyes without losing or killing one. I saw a set of these little kid commuters on my walk to work this morning. They were singing the Bo Bessie song (well, in my world it’s Bo Bess – as in Jessie Jessie Bo Bessie Banana Fanna Fo Fessie Me My Mo Messie – JE-SSIE!) and dancing around as they walked from one place to another. Their 3-yards-of-rope world was so Norman Rockwell-with-light-up-sneakers I almost lost it. In a way – we’re not so unlike these string kids – I thought. Some of us are moving around from place to place holding on for dear life to some home base that keeps us safe, together and in a previously determined order – rope, friend group, family… you see. Sometimes we get bumped forward or back on account of bad behavior or because we’re dating someone in the blue section, but on we march singing whatever mantra we’ve determine most helpful to the collective life phase (this month’s verse: I’ll start saving when I’m 26…). Some of us have made a run for it – dashing across busy streets toward ice cream stores in the distance without getting hit by a MAC truck or running to the corner but then freaking out and coming back. Others have just gotten hit. What’s weird about our rope versus theirs is that no one is telling us to hold on. Yes parents and mentors and friends make suggestions, but ours is a self-imposed procession. We hold on for the same reason – it’s safe and comfortable together in our too-big t-shirts – but when and why we leave is now entirely up to us. Lately I’ve been in a mad-dash-for-ice cream phase. I’ve mapped out a few different routes and keep a 5-er in my shoe so I can go the moment I’m ready – group mantras haven been written down for reference when necessary. Only problem is – sometimes I’m lactose intolerant. I don’t even know how I found this blog…. But I did, obviously. That, and I like this article. I myself have been making the mad ice cream dash lately. I’ve been viewing it more as rapidly approaching a many-pronged fork in a road, with a hell-to-the-consequences attitude toward which way I’ll ultimately turn the wheel.